Happy Halloween! For the first time ever, we will be staying in on Halloween and handing out candy to trick or treaters in our building. I still want to celebrate (obviously!) 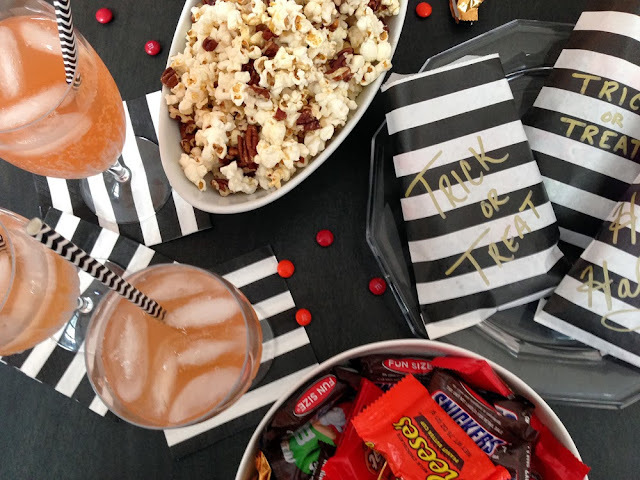 so I'm making a batch of sparkling blood orange punch and maple pecan popcorn for our adult guests. 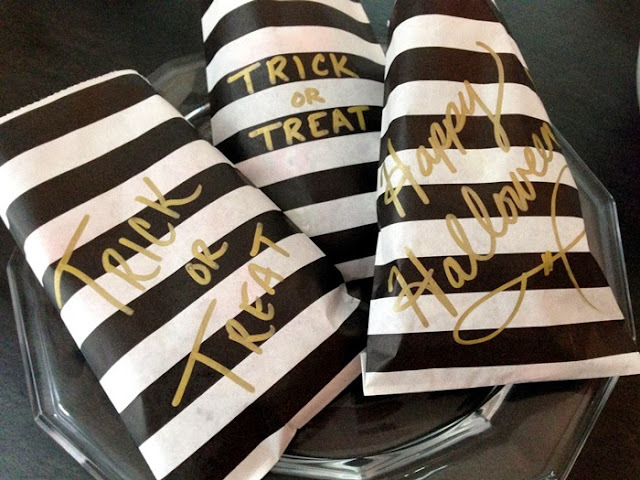 I also bought some goody bags so they can take home any leftover candy, that way I'm not stuck with it this weekend! 10 cups of plain, popped popcorn (I pop kernels in a pot on the stove like my grandpa did, but I'm told this is very uncommon. You can buy it pre-popped or microwavable, as long as it's plain). Toast the pecans: Preheat oven to 350. 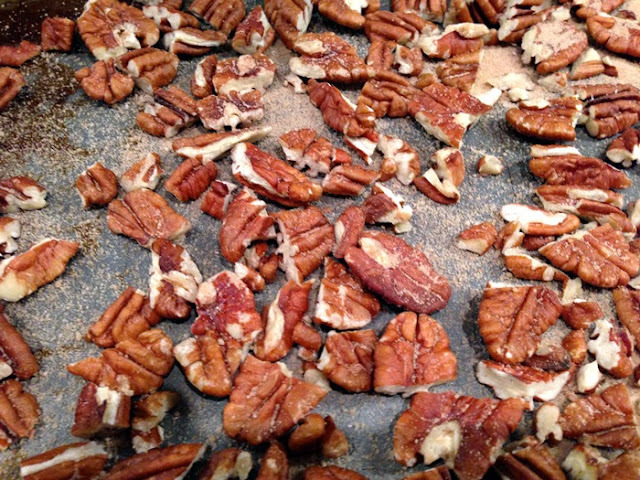 Chop pecans and sprinkle with your choice of sugar. I have a cinnamon maple sugar my mom sent me from Maine (her care packages are unreal). You can also mix brown sugar & cinnamon, or plain sugar & cinnamon - whatever combination you'd like! Toast in the oven for 5-7 minutes until they darken slightly and smell very nutty. Warm the maple syrup: Heat on medium-low in a saucepan until it is just slightly simmering. This will thin it out and make it easier to dispense evenly onto the popcorn. 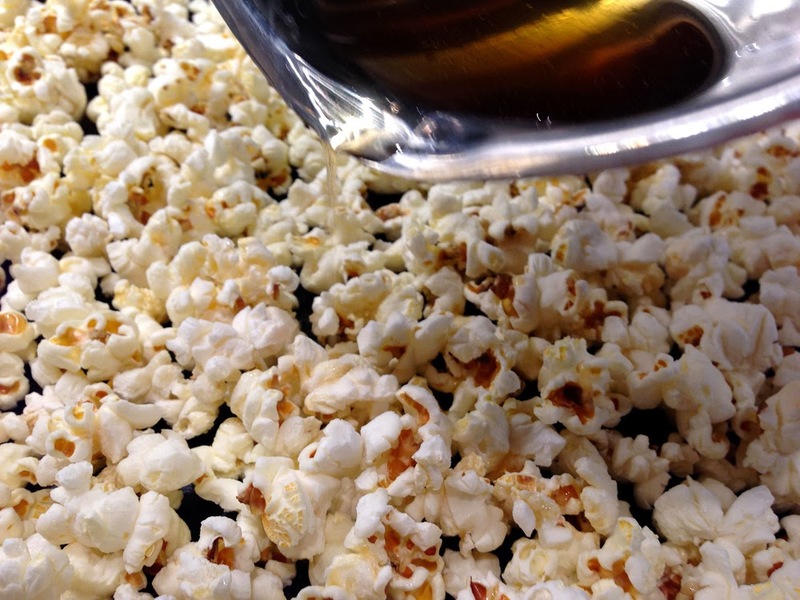 Put it all together: Toss the popcorn onto a sheet pan - you want a flat layer, so you may not be able to put all the popcorn on the pan at once. If that's the case, do this step twice. Use the lip of your saucepan or pour the syrup into a measuring cup so you can drizzle it slowly onto the popcorn. Sprinkle additional sugar mix if you want it really sweet (it is Halloween, after all!) Add the pecans and toss it all together into a serving bowl. Enjoy!